Big Brother isn't just watching - he's digging your moves, and he's not about to let something like legality or a concrete, windowless wall get in his way. "Thanks" to Range-R radar technology, cops can sense motion inside a space without even having to kick down the doors. 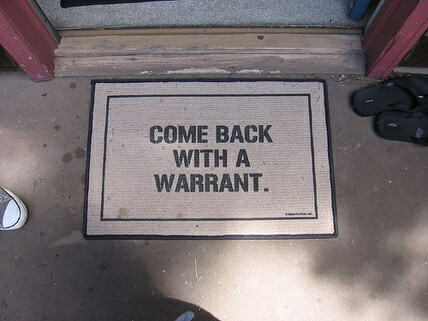 According to USA Today, over the last two years, some 50 law enforcement agencies across America have adopted this technology, because search warrants take time and randomly breaking and entering sometimes gets bad press. With no concern for privacy other than the privacy of the device itself (no notice of the technology nor its intents were released to the public), agencies from the FBI to the U.S. Marshalls to possibly your hometown cop-shop can now track you with the high-tech scanners. It allows for that extra few seconds of pondering before the strike team swarms the building. While plausibly for use in hostage scenarios, firefighting emergencies, or search-and-rescue (according to the manufacturer's website), the Range-Rs have already been used over such inanity as parole jumping. Originally invented for use in the wars in Iraq and Afghanistan, the devices, made by the L3 Communications company, cost $600 apiece. Some $180,000 has been quietly spent on them since 2012. While legal issues surrounding the use of the devices remain tricky, the Supreme Court specifically noted in a 2001 ruling that it was Constitutionally unsound to have police scan the exterior of a building with a thermal camera, and that the ruling would also apply to future radar systems. "What? We're just checking to make sure they're breathing...before we put a stop to that." So far, this ruling has gone unrecognized, as police maintain they are using the devices for the usual "security concerns." That tight security apparently precludes even mentioning that the Range-Rs exist. William Sorukas, a former supervisor of the Marshals Service's domestic investigations arm, even went as far as to say, "If you disclose a technology or a method or a source, you're telling the bad guys along with everyone else." Well, now the bad guys DO know. And the good guys too. Neither side should be happy about it. What happened to doing police work to catch criminals, instead of stooping to their level and committing crimes to summarily execute "justice"? Your security is just as important as national security.